When it comes to putting a finger on what’s happening with a home’s two most renovated rooms, no one does it better than the Canadian and American chapters of the the National Kitchen & Bath Association. In its 2018 Design Trends Report, the NKBA identifies the latest in client requests for their kitchen and bathroom overhauls. Here’s what’s trending, and what’s not. Contemporary-styled kitchens top the popularity chart in Canada, with 83% of professionals reporting them as “trendy” or “very trendy.” Transitional is the second most popular style (72%), while Mid-Century Modern ranks third (63%). Contemporary and Mid-Century Modern styles are significantly more popular in Canada than the U.S., while Farmhouse and Traditional are significantly less popular in Canada. As with their American counterparts, Canadians have a strong preference for painted cabinets (81%) and full overlay doors (83%). When it comes to cabinet construction, however, Canadians are significantly more likely than U.S. homeowners to choose frameless cabinets for their kitchens (89% Canadian vs. 68% U.S.). As far as both countertops and flooring are concerned, the Canadian numbers are nearly identical to those of the U.S., with quartz by far the most popular material and hardwood the predominant flooring choice, at 94% and 80%, respectively. 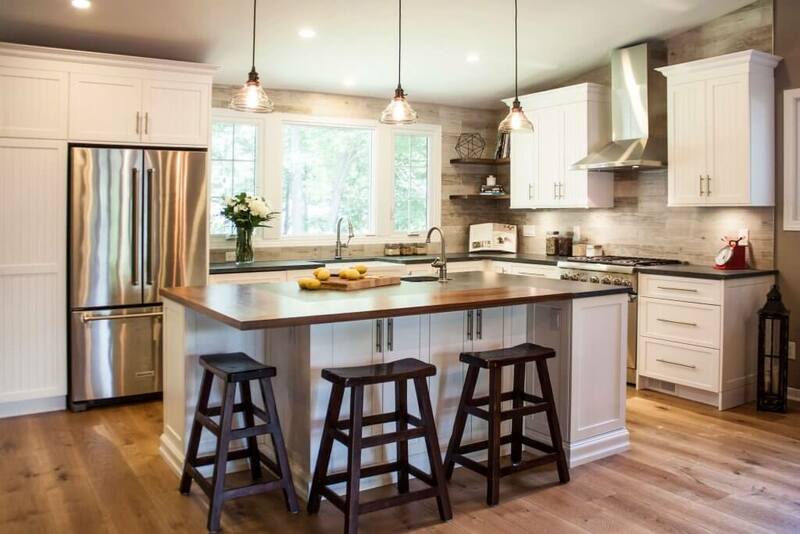 In terms of backsplashes, however, Canadian tastes could not be more different. Laminate (89%), concrete (80%) and painted wallboard (78%) are in vogue in Canada, while ceramic/porcelain tile, glass and natural stone tile are top choices in the States. As with the U.S., the trendiest style of kitchen sink in Canada is undermount (95%). Double-bowl sinks and island bar/prep sinks are also trending in Canada (78% and 73%, respectively). Not surprisingly, stainless steel is the most popular kitchen sink material, with 88% of Canadian professionals checking it off as trendy. 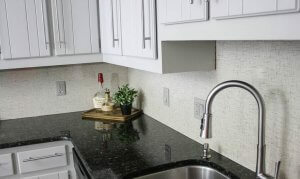 For the most part, taste in kitchen faucets is nearly the same in both nations, with single-handle and pull-down spray the most preferred styles, at 92% and 88%. In terms of materials and finishes, stainless steel is trending on each sides of the border (81% for both). The only notable difference is that chrome faucets are significantly more prevalent in Canada than in the States (78% vs. 61% in U.S.) and polished chrome a much more popular finish (79% vs. 58% U.S.). 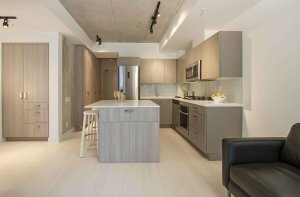 Grey and white are the trendiest kitchen colours in Canada, with 89% and 86% of respondents indicating their popularity. 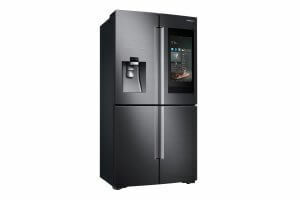 French-door refrigerators are the trendiest style (85%) in Canada, with bottom-mount and under-mount styles earning just 66% and 41%, respectively. More than three-quarters of pros report that wine refrigerators are now popular among homeowners. A notable difference between U.S and Canada is that Canadians are significantly more likely to use decorative panels over their refrigerators/freezers than Americans (70% vs. 52%). Among cooktops, gas is the top choice at 86%. Induction cooktops follow at 80%—significantly trendier than in the U.S. Convection ovens were reported popular by 89% of pros, followed by single-wall ovens and gas ranges, at 77% and 75%, respectively. Canadian preferences for dishwashers mirror the U.S., with homeowners overwhelmingly choosing door styles (89%) that are built-in (88%). Once again, decorative panels seem to be trending more in Canada than the U.S., as 77% of Canadian professionals report that these are a popular dishwasher installation, versus 58% of American respondents. Canadians’ preference for bathroom lighting fixtures echoes that of Americans. Their top three choices are under-cabinet lighting (97%), recessed lights (94%) and pendant lights (84%). 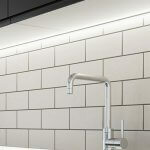 When it comes to integrating technology into kitchen designs, both countries are on the same page. Wall-mounted flat-screens are the most popular device homeowners already have in their kitchens (65%), followed by docking/charging stations (45%) and distributed audio (31%). As with American homeowners, Canadians have a strong preference for these styles in bathrooms: Transitional (67%), Contemporary (57%) and Traditional (52%). 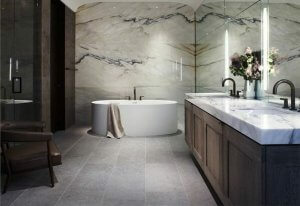 Canadian pros also report that Industrial-style bathrooms are very popular among their clients (also at 57%). Wood is the material of choice for bathroom vanity doors, with 83% of respondents citing it as trendy. Laminate, glass and acrylic are currently much less popular at 33%, 33% and 29%, respectively. Echoing a trend south of the border, both built-in and furniture-like pieces are common in Canadian bathrooms (83% and 69%). Unlike the U.S., however, frameless cabinets are the predominant choice in Canada, garnering a high vote of 83%, while framed cabinets were cited by just 12% of respondents). The top surface choices in Canadian bathrooms are identical to those in the United States: quartz countertops, porcelain-tiled floors and painted walls are the overwhelming favourites at 95%, 83% and 88%, respectively. 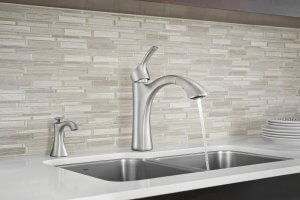 As in the U.S., the trendiest style of kitchen sink is under-mount, with 85% reporting they are trendy. Vessel sinks (59%) and integrated sinks (43%) rank a distant second and third. 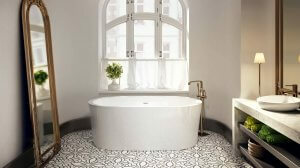 Porcelain is the predominant material choice in Canada at 76%. Glass (29%), decorative metal (29%) and stainless steel (24%) currently pale by comparison. Just as polished chrome dominates among kitchen faucet finishes in Canadian kitchens, so too is that the case on bathroom faucets. 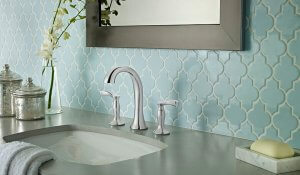 Its 81% rating on the trendy scale finished well ahead of brushed nickel (62%) and polished nickel (60%). 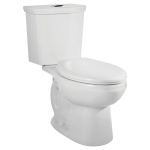 White and grey are also hot colours in Canadian bathrooms, with both being rated trendy by 88% of industry pros. Although blues and blacks are far less noteworthy at 53%, that’s a much higher number than in the States, where a mere 31% of professionals cited those colours as popular). Similar to U.S. results, shower lighting (91%) and recessed fixtures (79%) are the two most popular lighting options seen in Canadian bathrooms. Pendant lights follow in third place at 71%. The energy-efficient and water-saving products that Canadians are most likely to be installing in their bathroom designs include LED lightbulbs (85%), low-flow toilets (81%) and heated bathroom floors (78%). Although technology is taking over our lives, it hasn’t invaded the bathroom in much respect. Only a small percentage of Canadian homeowners have wall-mounted flat screen TVs in their bathrooms (19%), lighting controls connected to their mobile devices (17%), steam shower controls (17%) and smart bidet toilet seats (16%). 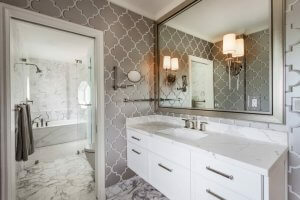 While the NKBA cited the number of Canadian respondents participating in the 2018 Design Trends Study as too small to report the median cost of remodelling bathrooms, south of the border the median costs of remodeling a master bathroom were $35,000 US, $15,000 US for a guest/second bathroom remodel and $7,500 US for a powder room. 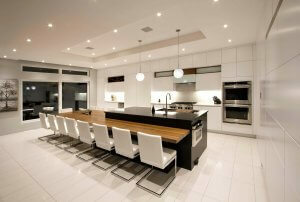 94% of respondents were NKBA members. 62% of respondents are K&B designers, dealers or remodellers. 77% of respondents are female. The majority of respondents are sole proprietors or firms with nine or fewer employees. Most companies represented have revenues greater than $1 million annually.